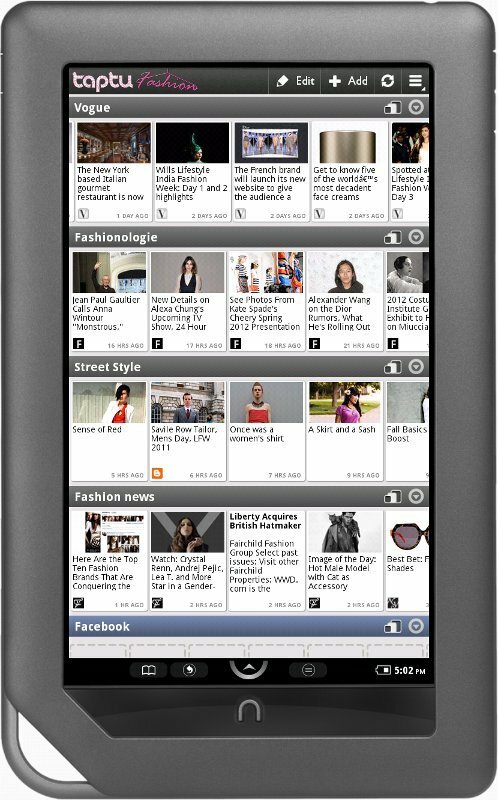 Taptu, the folks behind the popular news reader that lets you "DJ" your news, has announced three exclusive RSS feed apps for the Nook Color -- Taptu Fashion, Taptu Food, and Taptu Lifestyle. Each comes pre-loaded with content, and have over 200,000 streams from major media publications, social media sites, websites and blogs to add into the mix and personalize each. Taptu Fashion features content in the StreamStore from Fashionista, Jak & Jil, Nitrolicious and the Style Rookie, among others. Taptu Food works the same way, including content from recipes and restaurant reviews to celebrity chef social media feeds with tasty content provided by sites such as Epicurious, Eater, Food Network and Saveur. Taptu Lifestyle covers subjects such as parenting, do-it-yourself projects, travel, beauty, health and fitness, holiday entertaining and green living from popular sources like Jezebel, Parenting and Daily Candy. 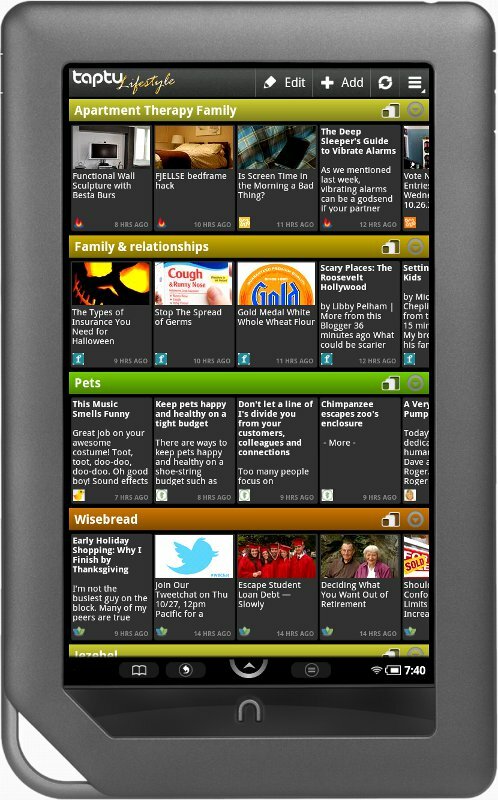 Taptu also allows you to sync feeds from Google Reader, and offers the inclusion of Facebook and Twitter timelines to make it a one-stop news outlet. With support for tools like Instapaper and Read it Later, as well as dark and light themes to make for easy viewing, it's a well designed app that is worth far more than the asking price -- free. You can find download links below, and after the break are pictures showing a bit more detail and the press release. CAMBRIDGE, England & DENVER – (November 10, 2011) — Taptu, the social media and mobile search technology company, today announced three new apps for enthusiasts of fashion, food and lifestyle, now available exclusively on Barnes & Noble’s new NOOK Tablet and NOOK Color, an award-winning device combining the best reading experience in rich, beautiful color with the most-requested tablet features. Taptu Fashion, Taptu Food and Taptu Lifestyle apps feature a customized user interface and specialized StreamStore offering over 200,000 streams from major media publications, social media sites, websites and blogs. These new NOOK Apps give users the opportunity to mix and match content and create streams that appeal directly to their own unique interests. Taptu allows users to DJ news and social media updates into personal, meaningful, organized playlists – as demonstrated by the over 150,000 original steams curated by current users. 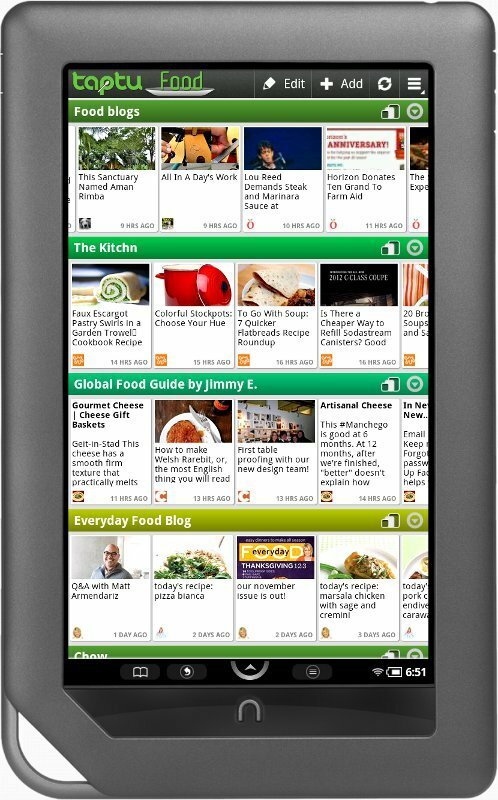 The new apps also provide handy tools including Instapaper and Read It Later integration for saving articles to read at another time, the ability to choose between light and dark themes, and the option of reading articles full-screen to take advantage of NOOK Color’s stunning 7-inch VividView™ display. Each of these new apps combines preloaded content with an abundance of topic-related news from publications, blogs, social media sites and RSS feeds. For instance, Taptu Fashion features content in the StreamStore from Fashionista, Jak & Jil, Nitrolicious and the Style Rookie, among others. Users can further build up their playlist of fashion-related news by including fashion-forward blogs and social media feeds from their favorite designers and brands. Taptu Food follows the same model incorporating everything from recipes and restaurant reviews to celebrity chef social media feeds with tasty content provided by sites such as Epicurious, Eater, Food Network and Saveur. Taptu Lifestyle is the perfect app for people who crave news and tips on subjects such as parenting, do-it-yourself projects, travel, beauty, health and fitness, holiday entertaining and green living from popular sources like Jezebel, Parenting and Daily Candy. “Everyone has a particular subject that speaks to them and our new apps for NOOK Color allow us to demonstrate the ability of the Tapform platform to provide a highly focused news ecosystem around any topic,” said Mitch Lazar, CEO of Taptu. The new apps are built on Taptu’s mobile media platform, Tapform, and feature a clean, intuitive design that gives users a slick and unique visual experience. Tapform’s search expertise and proprietary algorithms promote plurality and offer different perspectives by identifying contextual, related content for each story. Additionally, automatic elimination of duplicates in the stream ensures every item is relevant and has not already been seen by the user. See http://www.taptu.com for more information.